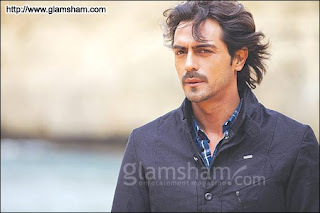 "He is so wondrously wooden that he could give the finest mahogany a solid complex"
~ NDTV Film Critic, On Arjun Rampal's character in We are Family. Its a pity, I was so damn looking forward to watch him on big screen after Raajneeti. Not too sure if I want to watch it now, but if I do I'll surely come out with my opinion on him. P.S: I don't think it matters if he can act or not, as long as he manages to look this good! The movie was good. Arjun looks good. But, acting, not so much. He hardly had few dialogues to deliver. You liked it? Haven't you seen 'Step Mom'?